PowerShell WIN+X Replacement Option in Windows 8. The Power User Menu, first introduced in Windows 8 and sometimes called the WIN+X Menu, is a really simple way to access popular system and management tools, especially if you have a keyboard or mouse. The Windows 8.1 update made the Power User Menu easier to access thanks to the newly added Start button, but also enabled a new option to replace the Command Prompt shortcuts on the WIN+X Menu with Windows PowerShell shortcuts, a more robust command line tool. Unlike some other WIN-X menu hacks that require editing the Windows Registry, replacing Command Prompt with Windows PowerShell on the Power User Menu is a simple settings change away.​ Replacing Command Prompt with Windows Power Shell on the WIN+X Menu should only take a minute or two. Note that you can only make this change in Windows 8.1 and later. Open the Windows 8 Control Panel. The Apps screen is probably the quickest way to do this on a touch interface but, ironically enough, you can also get there from the Power User Menu. If you're using a mouse and have the Desktop open, just right-click on the taskbar and then click Properties. Skip to Step 4 if you do this. In the Control Panel window, tap or click on Appearance and Personalization. The Appearance and Personalization applet won't exist if your Control Panel view is set to Small icons or Large icons. In either of those views, tap or click on Taskbar and Navigation and then move on to Step 4. On the Appearance and Personalization screen, tap or click on Taskbar and Navigation. Tap or click the Navigation tab on the Taskbar and Navigation window that should now be open. It's just to the right of the Taskbar tab that you're probably on now. In the Corner navigation area at the top of this window, check the box next to Replace Command Prompt with Windows PowerShell in the menu when I right-click the lower-left corner or press Windows key+X. Uncheck this box if you'd like to replace the existing Windows PowerShell shortcuts in your Power User Menu with Command Prompt shortcuts. Since showing Command Prompt is the default configuration, you'll probably only find yourself in this situation if you've previously followed these instructions but have since changed your mind. Tap or click OK to confirm this change. From now on, Windows PowerShell and Windows PowerShell (Admin) will be available via the Power User Menu instead of Command Prompt and Command Prompt (Admin). This does not mean Command Prompt has been uninstalled or removed from Windows 8 in any way, it's just not accessible from the WIN+X Menu. 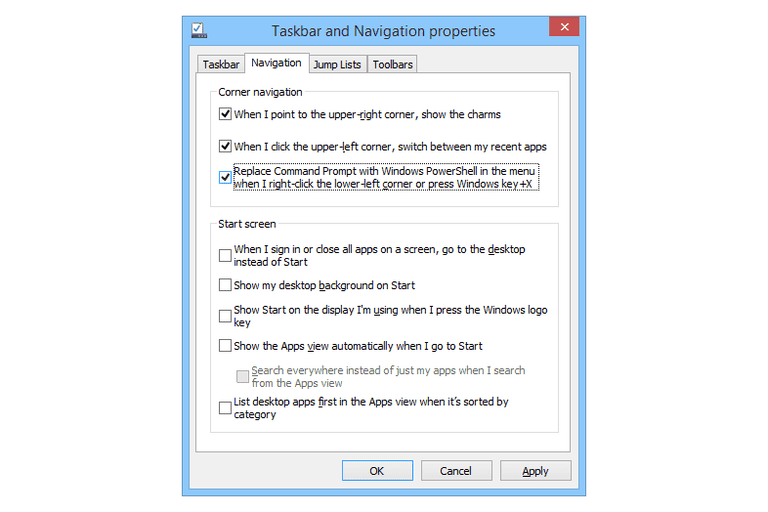 You can still ​open Command Prompt in Windows 8 like any other program, anytime you want. As I mentioned at the beginning of this tutorial, Windows PowerShell is only an option for the Power User Menu if you've updated to Windows 8.1 or greater. If you don't see the option from Step 5 above, update to Windows 8.1 and try again. See How to Upgrade to Windows 8.1 if you need help.